The Way Up peak running concept explained. Big vertical done quickly. 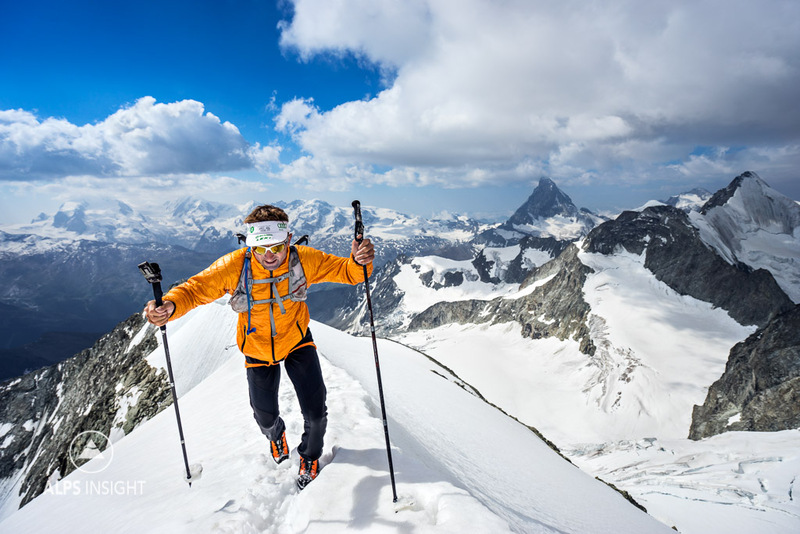 Ueli Steck on the Zinalrothorn's regular route during his 82 Summits project in 2015. The idea for The Way Up came from years playing in the mountains with a great friend who pushed me to my limits, and opened my eyes to what was possible. This friend was Ueli Steck. I joined Ueli for a few days during his 82 Summits project in 2015 when he climbed all 82 of the Alps 4000 meter peaks with no mechanized support; running, paragliding and biking between peaks, all in one 61 day push. He asked me to join him for the Zinalrothorn, a peak I had previously climbed a couple of times. The deal was he'd meet me at the Rothhorn Hut after having done the Obergabelhorn earlier that morning. My strategy was to run up to the hut from Zermatt early in the morning and wait for him, then we'd continue to the Zinalrothorn together. No matter how hard I tried, I never really had to wait for Ueli for much of anything. Of course he was already there when I arrived. Together we ran up the peak, wearing running packs, light boots, and taking only a short rope for the down climbing. We were up and down it in just a few hours. Back at the hut for lunch. I had been climbing classic routes in the Alps for 16 years, and typically did them in the traditional style; hike to hut, spend the night, get up very early, climb mountain, descend. It's how the masses do it. Ueli wasn't the masses. He was basically trail running the 4000 meter peaks of the Alps, and woke me up to what I could be doing if I combined my climbing skills with my trail running fitness. We each have our own version of what is possible relative to our abilities. 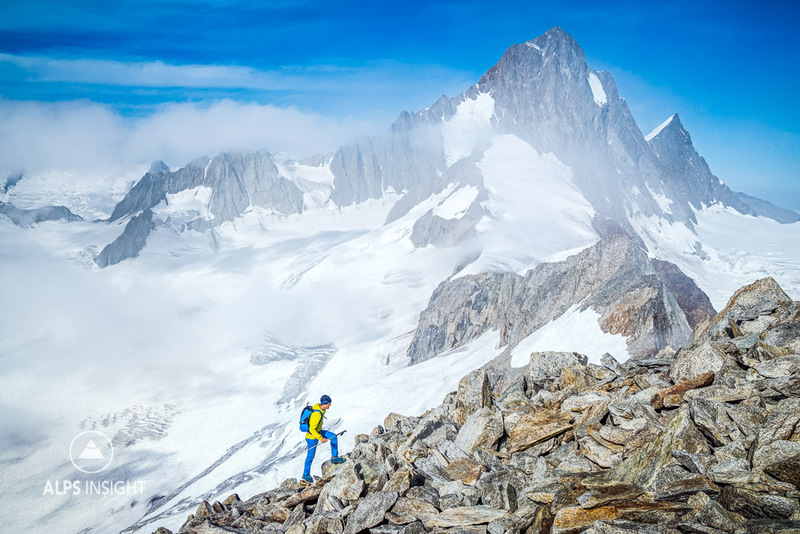 For me, I can do many alpine peaks in running shoes, or some of the new ultralight climbing boots. So, why not do what is normally done in two or three days, in one? I was a climber long before I was a runner and for me trail running for the sake of running is often not enough. I had found an outlet to put all my mountain skills to the test, from fitness, to gear, to planning. I called it The Way Up because.... well, a lot of the days you go Way Up. But not just that, you need to know the Way Up as these can be more complicated routes, without trails. The Way Up routes are not for everyone, so we'll do our best to detail what is involved to do them. They are not solely running on trails. They may require climbing skills, glacier travel, and a solid knowledge of what will be encountered, and how to safely deal with it. 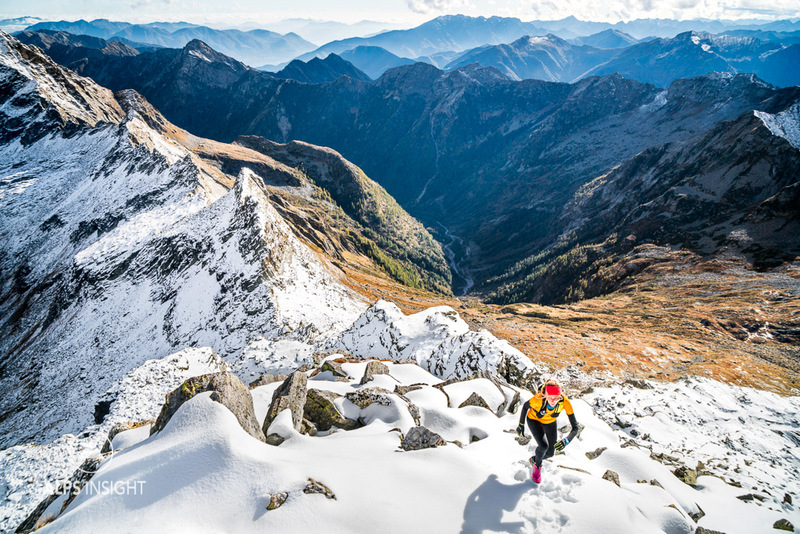 This style of mountain running is not just about being able to do the peaks, it is knowing when you can do the peaks. Your gear will be lighter and without the safety margin that some types of gear afford, requiring you to understand that you are committed to going up, or coming down, quickly. Speed, continual movement, and experience are your tools. Combine all these things and you have the potential for big rewards. For me, The Way Up is my personal project that I am most passionate about. You can follow #thewayupALPS on Instagram and read about ultralight trail running gear at ALPSinsight. ALPSinsight's Kim Strom on a Way Up discovered in Switzerland's Valle Verzasca, Monte Zucchero. Switzerland's Oberaarhorn is a classic Way Up peak, combining trail running, glacier travel and finally an easy walk up an alpine peak with big views. 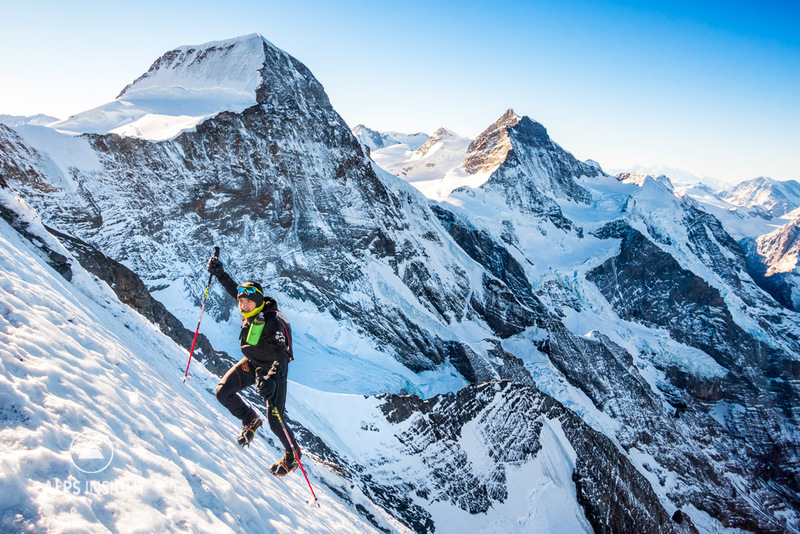 One of the Alps ultimate Way Ups ... Ueli Steck and Dan Patitucci did the Eiger's West Flank from Grindelwald during the dry winter of 2016/2017.